"I’m going to build a place where young people can challenge to reach any of their dreams!" The 7 genius students, known as the GREAT 7, launched a project to construct an artificial island called Nanae Island to realize their leader, Nanana Ryugajo’s peculiar idea. 12 years later, with a total population of 100,000 people with as much as 80% of those inhabitants being students, Nanae Island has successfully become prosperous as a special student zone. One of the island’s newest residents was Jugo Yama--a high school student who had just transferred to the island after being disowned by his father. One day, Jugo finds in his own apartment the earth-bound spirit of the late Nanana Ryugajo, who was murdered by someone 10 years ago! Jugo’s plan of living alone was suddenly thwarted by this strange roommate. 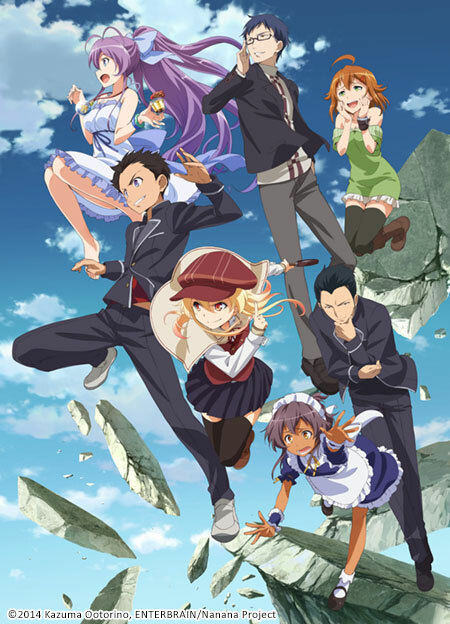 The original novel “Nanana’s Buried Treasure” won the Grand Prize of the 13th Entertainment Awards, which was the first Grand Prize in eight years. This anime series features the adventures and challenges of Jugo Yama as he searches through the historic ruins of Nanae Island for the great treasures, A.K.A “Nanana’s Collection,” along with the extraordinary characters he meets along the way. The mysterious puzzles of the ruins! The excitement of the treasure hunt! The strategic maneuvers and battles of thought and reason between the characters! Nanana’s Buried Treasure is an adventure you won’t want to miss!